The local mobile scene is a fiercely-contested stage with brands that release new handsets every now and then. 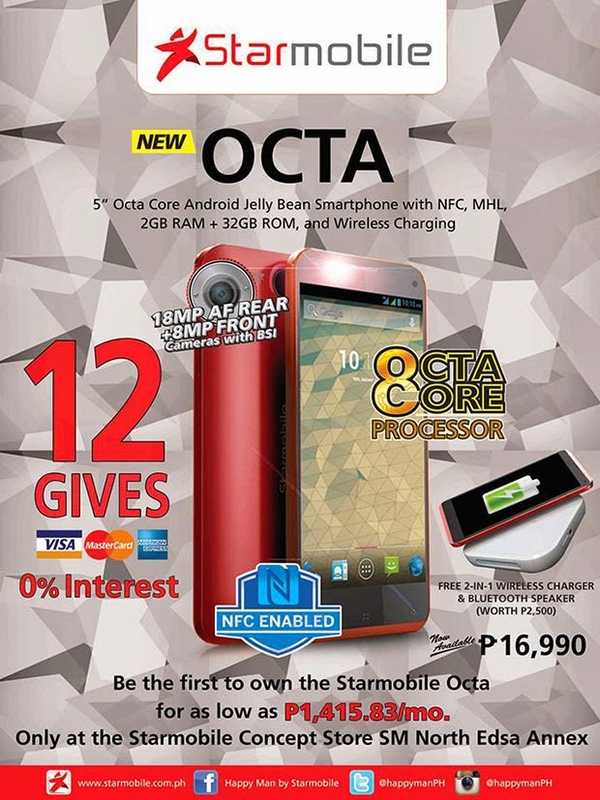 The latest powerhouse unveiling goes to Starmobile, the brand that gave us the Diamond X1 gears up for another “octa-core” smartphone which, to live up with its marketing-feature, will be called Starmobile Octa. The device will streamline both 1.7GHz octa-core MediaTek MT6592 SoC CPU and Mali 450MP4 graphics unit in a 5-inch Full HD screen. The fact that this device will carry the Starmobile’s flagship tagline would definitely justify its beefy 2GB RAM and 32GB internal memory storage. The rear camera is an 18-megapixel BSI affair, just enough reason to keep those looking for a decent camera on queue. You’ll also get an 8MP “selfie” shooter that is also treated with BSI on the front panel. Likewise, the device will have the same set of radios – Bluetooth 4.0, WiFi, NFC, and HSPA+ support. But the Octa is not all bells and whistles; the battery might turn you off a bit with its 2300 mAh capacity. However, if you’re not always on the road, this wouldn’t be a burden. You can get this device for Php 16,699 and Starmobile is offering it in installment basis for Php 1415 a month if you hit up its SM North Edsa concept shop.